I recently flew through LA on my way to meet up with our incredible local partners in Boston and Toronto. We absolutely love to practice what we preach at UA so when it came to getting into town from LAX (Los Angeles International Airport), I was only ever going to take the public transit option. Despite getting the lowdown on what to do from our partner Summer, I managed to quickly screw it up – resulting in losing $5 and having to go back to the dreaded transit machine. After scratching around for change, I realized I hadn’t even figured out how to achieve the flexibility necessary to check out Hollywood, Koreatown, and a few other local sites! I hate screwing up so on my way back to the airport I retraced my steps to see where I went wrong in the hope of helping others not botch it the way I did. 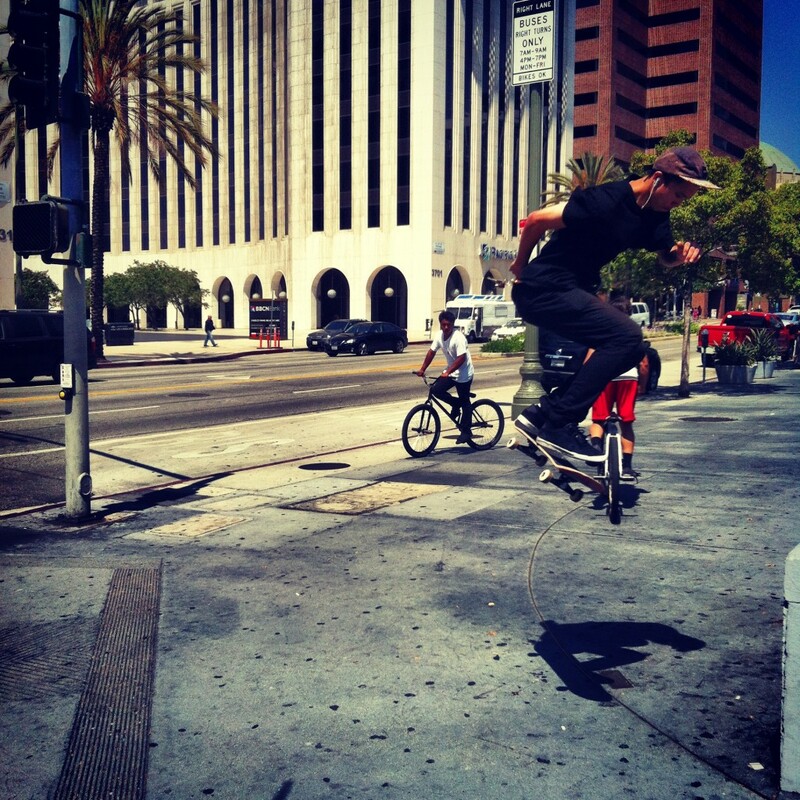 Once in town I did get to see some cool local life like these guys skating. Exit the Airport and look for the blue “LAX Shuttle – Airline Connections” sign in the median strip by crossing over one cross-walk. 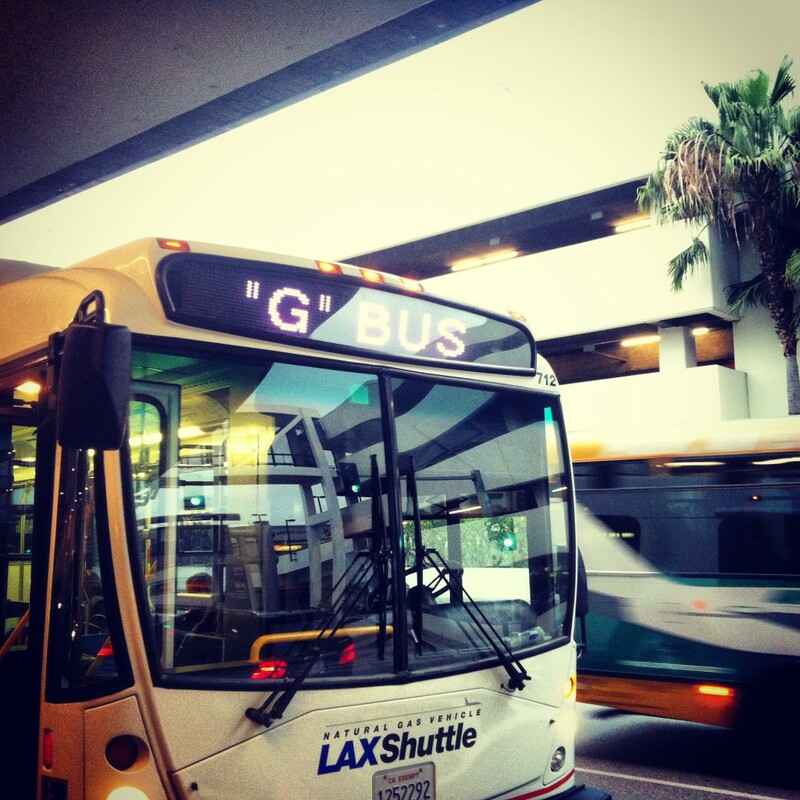 Free bus to Metro at LAX – this is the stop. Wait for a G Bus. Other buses stop here going to car parks and some mysterious Route 55 but you want the G – its free!!!! Get on through any door. 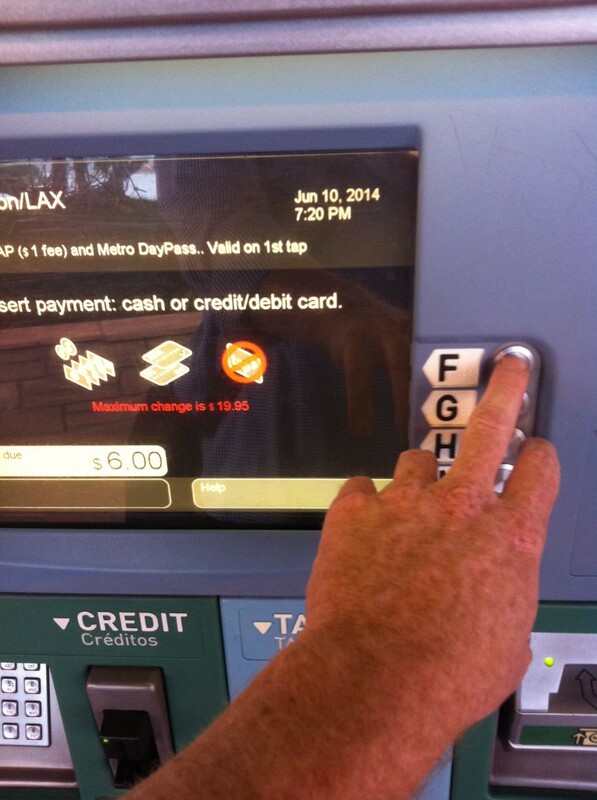 Catch the free G to the Metro Green Line. 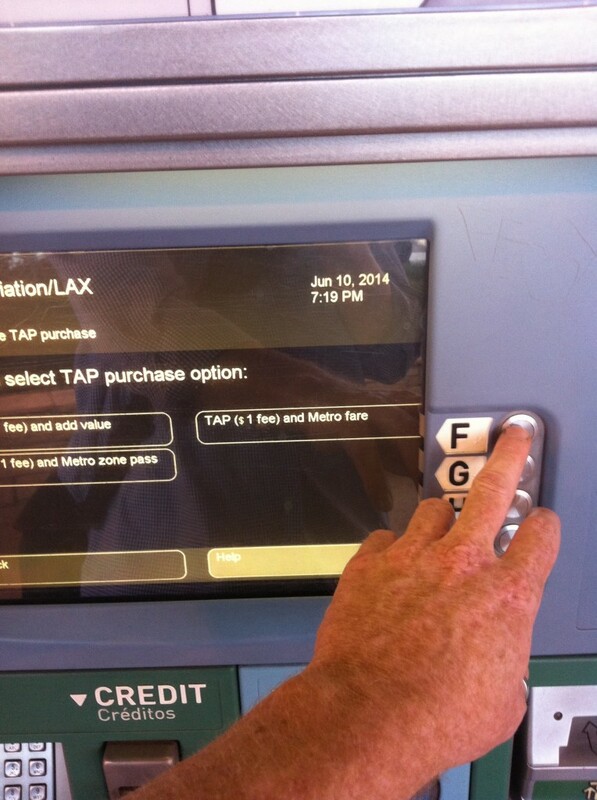 Get off at the metro stop – Metro Green Line Aviation Station. It should be pretty obvious when you get there. It’s the last stop so everyone will be getting off. Head over to the ticket machine. This is where it all got a bit funky for me. Lots of people get off the bus and everyone wants to get a ticket. There was a queue behind me. I panicked. I cracked. I went on a button-pushing frenzy. I bough a TAP card and put $6 credit on it (“add value”) – because I knew an all-day pass was $6. Bom bom. It doesn’t work that way.You have to specifically choose the Day pass. Here’s the right way to do it. First step is to click “A” to indicate you want to buy a new TAP card and you’ll arrive at the screen below. Ticket Machine – this is make or break time – I broke. 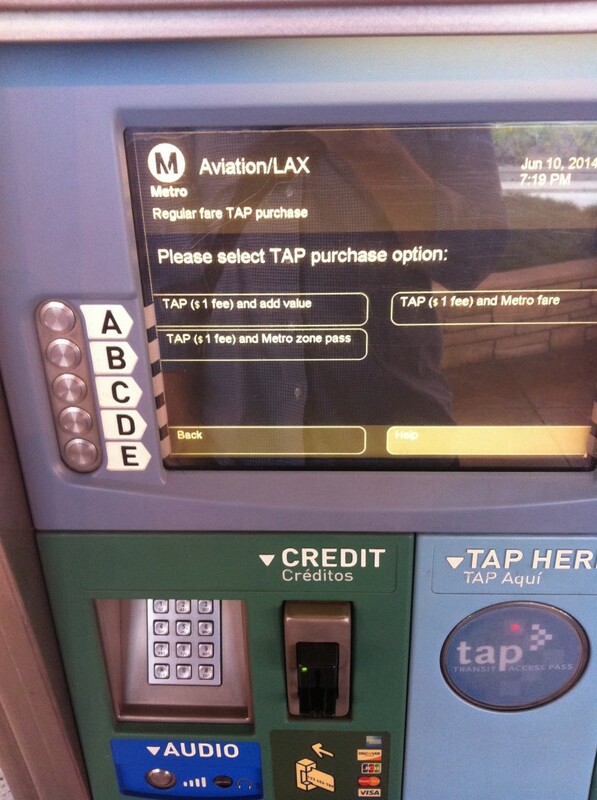 You want TAP ($1 Fee) and Metro Fare. Click F.
You want to choose F again to get the Day Pass. Total cost is $6 (as of June 2014) to get you anywhere you want to go for the whole day on metro and buses (some zone charges may apply – apparently – but if you find yourself in that situation – you are probably lost). With card in hand – you just now need to know where the hell you’re going. No doubt with strong influence from the taxi industry, they’ve made getting into town as complicated as possible. Tap your card and head upstairs. Catch the train heading to Norwalk (not Redondo Beach direction). You need to change to the Blue line at Imperial/Wilmington and head in the direction of 7th St/Metro Ctr. Once you get off there its up to you to decide where you’re going to spend your day (Hollywood, Koreatown, China Town etc). The full map is below. 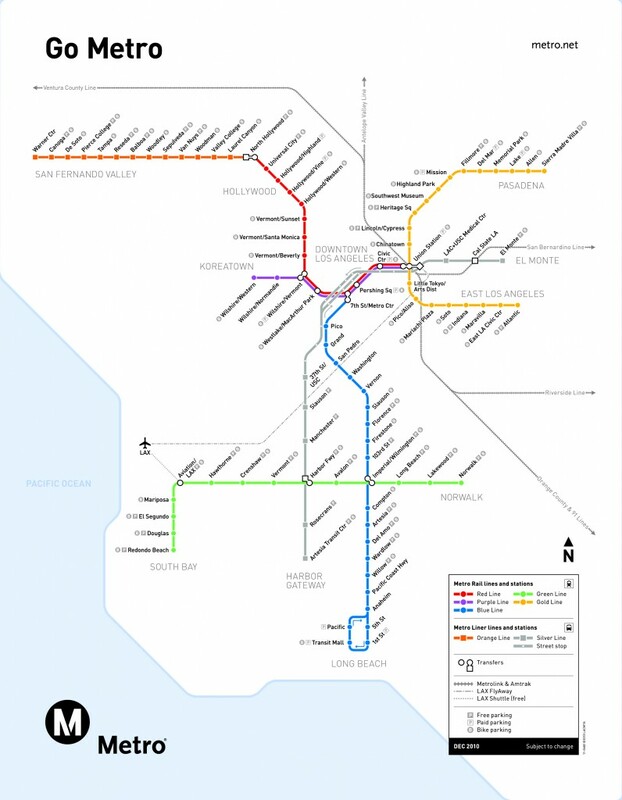 Good to have on hand is the metro map! Having read through this post you will swiftly be the proud owner of your very own TAP card loaded up for a full day’s worth of exploring – your passport to LA. Back at the airport, there will be some other people milling around the machine, looking confused, and pacing back and forth on the median strip (I counted 5 of us without a clue when I was there). You can be the hero and help them out with confidence – maybe you’ll even make some new friends to spend the day with. Oh – and if you are just getting straight out of LA and heading somewhere else from Union, skip all this and just get the Flyaway straight there (go to the Green sign in the median strip at the airport).